Credit utilization rates and debt-to-income ratios are two very important factors in a consumer’s ability to qualify for new credit. If you want a strong FICO score and great borrowing rates, it’s imperative to understand how these factors work. AMOUNTS OWED (30%) – This means your credit utilization ratio! Do not avoid this topic … it’s literally the only variable with the power to change your score FAST! Please take the time to read through this post as it will not only explain how these ratios work, but also how they can be manipulated. If you want your credit score to go up, then this post will be as good as gold! What is Your Credit Utilization Rate? In laymen terms, your credit utilization rate is the amount you owe to creditors versus the total amount you can borrow from them. Your utilization ratio is calculated by counting the balance and credit limit for ALL revolving accounts. Installment loans, such as mortgages, are considered but do not hold as much weight. For calculation purposes, focus on your revolving utilization ratio first. According to Credit Karma, there is a direct relation between your FICO score and your utilization rate. Those who manage to maintain low credit utilization typically have good credit scores. The only exception was in the case of 0% utilization rates, as these were often the result of inactive borrowing accounts. Without any payment history to contribute towards the 35% of your score calculation, it’s hard to get ahead. … but how can it have such an impact? This single factor makes up for 30% of your FICO score! The current FICO scores that exist (yes, all 50-plus) work with the same calculation algorithm. They value your score with 30% of the calculation coming from your credit utilization. This means it makes sense to increase your credit availability — even if that comes at the cost of opening new credit cards or asking for limit increases. What Gets Factored Into Your Credit Utilization Rate? Your credit utilization will not be hurt as much from a higher utilization in installment credit accounts. This means you do not have to worry about a large student loan causing your utilization rate to be sky-high. If this was the case, the vast majority of Americans would not be able to qualify for a home loan. Your car loan, home loan, home equity loan, and student loan will not be weighed as significantly as your revolving debts — such as your credit cards and home equity lines of credit. As such, you should focus on reducing the ratio for your revolving credit accounts first. Your FICO score factors any co-signed debt, which means the utilization rate of that debt will have an impact on your total credit utilization. As installment loan utilization rates do not impact your credit score as much, it would be wise to weigh your outstanding debts based on their score impact — this is why many pay their student loan off last. If you ever plan to buy a second home or investment property, you can take out a home equity loan to fund the purchase while keeping your utilization lower and score higher to get the best rates possible. The fact that installment debts do not count for as much does not mean you should avoid them, because credit diversity still makes up for 10% of your FICO score. Closing a credit card after paying it off is not a good idea, because the drop in available credit will result in a worse credit utilization rate. “Debt-to-credit” is another term that gets used, as it easily explains how credit utilization works. This causes confusion as some interpret debt-to-credit and debt-to-income as similar. In reality, debt-to-income is completely different and is factored by lenders but does not impact your credit score. If you hear ‘debt-to-credit’ then they essential mean the same thing — credit utilization ratio. What’s a Good Credit Utilization Rate to Have? Generally speaking, you can get by with a utilization ratio between 35% and 40% as long as your income is sufficient. This range will prevent you from getting rejected for many decent credit cards, which can help you further build your credit. Although, you will not notice your credit score increase much until your utilization rate decreases. 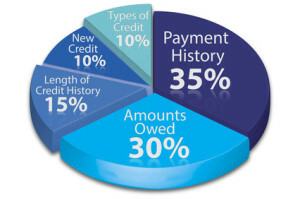 New credit availability does not help your score as much, but maintaining the improved ratio will pay off with time. You should target a utilization ratio of no more than 30% on all revolving credit accounts. While doing so, you do not need to focus on balancing your utilization rate between cards. Having a higher utilization on one card means little as it’s only your full ratio across the board that factors into your credit rating. If you are buying a house, 28% or less would be a better target. The lower you can get it, the better. If you can get all your credit cards paid off that would help a lot. As we’ve mentioned, these (and other revolving debts) play a big part in your credit score calculation. The lower you can get your utilization ratio, the more strength you have when negotiating with a lender. It gives you a better shot at picking up excellent borrowing rates. Even better, you will qualify for much more when financing a new car or a home if you can drastically reduce these outstanding debts. But, you could benefit from keeping utilization rates low all-around as your credit card issuers would be more inclined to offer you limit increases. These offers should be taken up as long as you trust yourself with more available credit — the result will be less credit utilization and a higher FICO score. How is Your Debt-to-Income Ratio Calculated? Your debt-to-income ratio is also a simple equation, as it looks at the amount of debt you have as compared to the amount of recurring income you receive. Things can get confusing fast when you analyze how this ratio gets calculated. It’s not actually about your outstanding debts, but rather your monthly debt payments; lenders just want to know you can afford to pay off more debt each month. Further, it’s not just your debts that matter — your recurring expenses will also be taken into consideration. There are many types of debts and sources of income that factor into this equation. However, you must understand that some things are exempt and this could either be good or bad for your debt-to-income ratio. What debts are considered for your debt-to-income ratio? Your recurring payments on other debts — such as charge cards. What income is considered for your debt-to-income ratio? The amount you receive in pension and/or Social Security payments. There are other types of incomes that might qualify, such as rental property income. You must find out from the lender whether they are willing to consider your alternative income streams. What’s a Good Debt-to-Income Ratio to Have? Unless you have a massive down-payment or valuable assets for collateral, no lender will take you serious with a poor debt-to-income ratio. It is the pivotal number that determines whether or not a borrower can afford to take out more debt. Of course, this figure gets lined up next to the credit utilization rate — combining the two makes it easier for the lender to understand the worst case scenario. When credit utilization gets factored, they have a good idea on how much your monthly expenses would be if you maxed out your current available credit. When buying a home, people get shocked when they find out that their mortgage costs will get factored into their debt-to-income ratio. This has to happen, because your expenses will no longer be the same. There’s a catch: when buying a home for yourself, your “debt” part of the equation changes to accommodate the monthly housing costs you will soon face. In general, your new home costs should make up to 30% of your monthly income. With all factored, your target should be 36% or less. The 28% figure factors your mortgage payment, taxes and insurance. The higher percentage targets factor not only your housing costs, but also your debt repayments and other expenses. There are various ways you can bring down your debt-to-income ratio. For example, you can reduce your living costs before applying, or purchase a property with rental income, to smooth the ratio. Conclusion: There’s Much to Know, Learn More! FICO scores, home loans, and everything in-between makes for hard topics to discuss. There are countless variables at the lender level, and even more that vary by consumer. If you want to have the best chance for approval on any credit card or loan, and first picks at the greatest rates and rewards, you need to master this subject. We have an extensive amount of detailed posts relating to credit-building, credit reports, FICO scores, home loans, and more. If you are looking to boost your FICO score, we recommend you start out with our post: ‘6 Tricks to Significantly Increase Your Credit Score with Credit Cards Only!‘ — also, check out our post explaining how FICO scores work if you are not familiar with them already. Read These Five Facts to Understand Your FICO Score! Business Identity Theft – A Must Read for Small Business Owners!